Artworks created by children at Indian Residential Schools and Indian Day Schools, which are the foci of much of Dr. Andrea Walsh’s present work, are objects at the center of a firestorm around issues of colonial violence, appropriation, objectification, and in many cases, governmental profit. Cultural and educational institutions that hold such collections must go to extraordinary effort to bring them to prominence in their agendas of reconciliation. Community/activist based scholarship is an ideal mode of inquiry and collaboration that seeks partnerships between institutions and communities to address issues of social justice and reconciliation. For Indigenous individuals and families, the meanings for objects held in museum collections are fathoms in depth beyond colonial records of acquisition and exhibition. 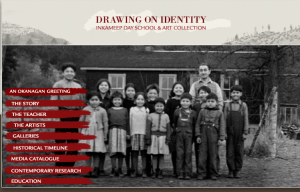 In the specific case of the Indian Residential School and Indian Day School art collections, these collections of art represent the very people, relations, and ancestors who attended the schools. In many cases, they are the only remaining traces of these childhoods. The RIDSAR work began with Indigenous children’s art collections and community-based research began with an invitation for Dr. Walsh to participate as a collaborator on the first Social Sciences and Humanities Research Council (SSHRC) CURA (Community University Research Alliance) Grant awarded for cultural research through the History in Art Department at UVIC. The goal of this University of Victoria CURA was to develop collaborative alliances between the University of Victoria, its partners, and the arts and heritage community throughout British Columbia. The five CURA partners, the University of Victoria, the Royal BC Museum, the Art Gallery of Greater Victoria, the BC Museums Association, and the Heritage Society of BC offered their research, teaching and curatorial resources to assist with community-based projects. The program was designed to help community organizations research and document local visual arts collections and heritage property. A primary objective was to develop an integrated body of knowledge of provincial collections that would be available to a wide audience. The CURA program completed its five-year mandate in July 2005. The Osoyoos Museum Society applied to this CURA looking to partner with the university to research a collection of what they assumed where about 30 drawings created at the Inkameep Day School in the late 1930s and early 1940s. The story of the art production at the school spans 10+ years between 1931 and 1943 and its history sheds light on the role children played in national discourses of identity during the pre-war era, as well as demonstrating the importance of the repatriation of material and knowledge to Indigenous communities today for the purposes of nationhood building and economic development. Following the phase of active research, Dr. Walsh worked on behalf of the Osoyoos band with the museum exhibition design firm Aldridge Pears of Vancouver to transfer the research about the story of recovery and the art of the Inkameep Day School into material and content necessary for the production of a permanent feature exhibition as part of the Osoyoos band’s 9 million dollar Nk’Mip Desert Heritage Centre, which opened in 2006. The Inkameep Day School project also began the work of utilizing art galleries as spaces of social change and challenge. As part of the CURA grant, and a SSHRC Insight grant (2003-2006) the museum, band, and Dr. Walsh worked to create a travelling exhibition of 25 works of art that is available to cultural institutions for exhibitions and educational purposes. Over the course of the CURA grant and in the years following, the team worked to actively seek out opportunities to exhibit the Inkameep art in venues of various sizes and locations to engage the public in dialogues about Indigenous children’s histories in Canada. The Inkameep art was the feature of multiple exhibitions that were located in small community settings such as the Langham Cultural Centre, in Kaslo, BC, to large urban contemporary art spaces such as the Vancouver Art Gallery for the blockbuster exhibition, Drawing the World: From Masters to Hipsters (summer 2003) (Page 5) and (see Vancouver Art Gallery exhibition opening). The Inkameep Day School research reached beyond the localized arts community. The work was a sought after inclusion in national research policy discussions. In 2002, Osoyoos Band member Brenda Baptist and Dr. Walsh travelled to Ottawa for meetings co-hosted by the Department for Indian and Northern Affairs Canada and the University of Western Ontario. ), and finally demonstrating the benefits of collaborative research and interdisciplinary research and scholarship. Also in 2002, Brenda and Dr. Walsh presented our work at SSHRC workshop in Ottawa focused on the development of strategic priorities in the area of aboriginal research. 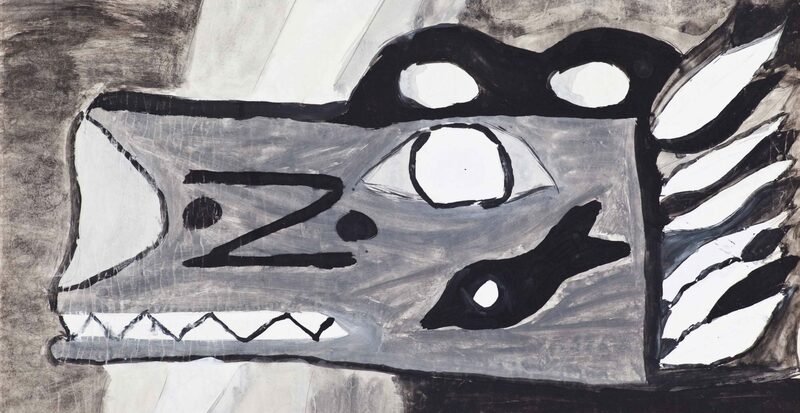 In 2008 the University of Victoria’s Legacy Gallery was gifted 700+ paintings created by Indigenous children between the late 1950s and early 1970s. The paintings were created in art classes taught by Canadian artist Robert Aller. Upon his death, his family gifted the massive collection of childrens art to UVic. The majority of the paintings were created by Ojibwe and Algonquin children who attended in summer camps with Aller that were funded by the Department of Indian Affairs in the early 1970s. Prior to these camps, Aller volunteer taught in two residential schools: the Alberni IRS in Port Alberni, British Columbia and the MacKay IRS in Dauphin, Manitoba. Children who attended these two residential schools during the late 1950s and early 1960s created 136 paintings in the collection. In 2010 Dr. Walsh ran a special summer class in anthropology (ANTH 395) on curating Indigenous art collections. This class provided students at UVic the opportunity to work in a hands-on manner with the collection of paintings and the associated 2000+ page personal archive of documentation and correspondence that accompanied the collection. This documentation work by students revealed the names of the children who created the paintings and information about Mr. Aller’s experiences as a teacher. The Alberni IRS paintings were brought out for the first time in almost 60 years at the TRC Regional Event in Victoria in April of 2012. Overwhelming response to the paintings created a desire in community to follow through with locating Survivors to repatriate the work to them or their families. This process took a year and a half year of concentrated work with Survivor networks, and we managed to locate 90% of the people through Survivors family and social networks whose names were on the 50 paintings we exhibited. See AIRS Repatriation for the backstory of how these paintings were returned. The work described above was made possible in part through funding Dr. Walsh received from a SSHRC Insight Development Grant in 2012. This grant was principally to conduct a nation wide survey in search of similar residential school collections to the Alberni collection. At this time, this data is being analyzed and will provide the only available status on such collections across institutional platforms in Canada. This money also supported the Survivor led research that has accompanied the Alberni paintings exhibitions between 2012-2014. Additional internal SSHRC monies have supported Survivor participation in exhibitions, travel, and educational events. The Alberni IRS paintings have been collaboratively exhibited at the Legacy Gallery in Victoria (May 2013), the Penticton Museum (June 2014), the Alberni Valley Museum (2014/15) and Emily Carr House (Sept. 2015). All of these exhibitions have an educational component for students. School groups attend the exhibitions and Survivors from the repatriation project have given talks to students. Survivors and Dr. Walsh have given lectures on residential schools, repatriation and reconciliation. Dr. Walsh and her students were invited to bring the paintings to annual BC Elders’ Gatherings in both 2014 and 2015. At these gatherings, Survivors and Dr. Walsh have given presentations on their reconciliation work to other Elders, Survivors, and their families. This kind of knowledge transfer within Indigenous communities has been an important part of their work together. On September 30, 2015, Dr. Walsh and her PhD student Jennifer Robinson, were the only non-Survivor guests invited to present at the Residential School Survivors Day of Remembrance at Tsow-tun-le-lum Lodge on Vancouver Island. There, they presented with 6 of the Alberni IRS Survivors the work around healing and paintings to other Survivors. In December 2015, Survivors from the Alberni IRS who have formed a Steering Committee for their work along with Dr. Walsh received the 2015 Heritage Award from the Alberni Valley Heritage Commission for their contribution to the Alberni Valley Museum’s exhibition We Are All One. It was the first time the Commission awarded a group this honour. The award truly honoured their collaborative efforts. 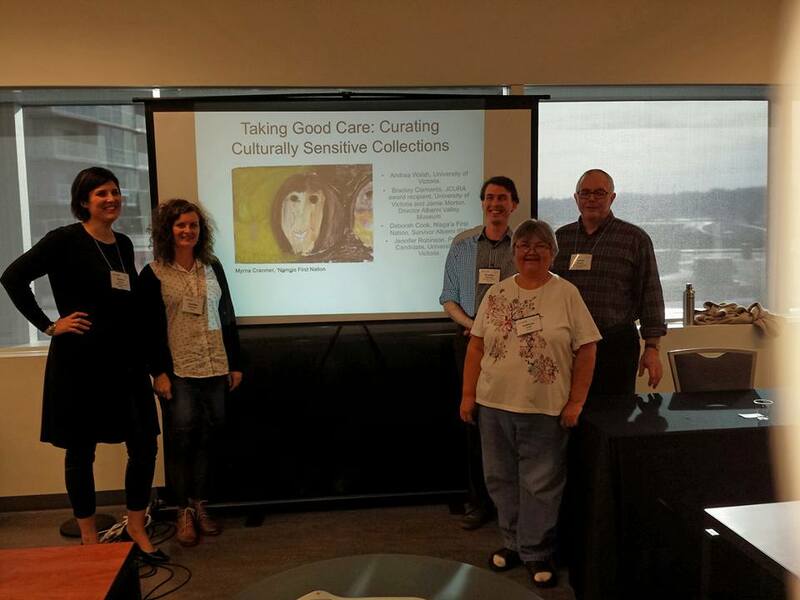 In 2015 Survivors, the Director of the Alberni Museum, undergraduate and graduate students and Dr. Walsh formed a plenary panel at the BC Museums Association annual conference. The panel titled “Taking Good Care: Curating Culturally Sensitive Collections” was delivered to a standing room only audience. Panelists each described the act of repatriation and reconciliation through this project from their perspectives and experiences. Of the 700+ paintings, many of the pieces were from Algonquin and Ojibwe nations in Ontario. In the summer of 2013, Dr. Walsh began collaborating with Dr. Darrel Manitowabi of Laurentian University, and from the Wikwemikong First Nation to repatriate 175 paintings to three Ojibwe communities on Manitoulin Island in northern Ontario. In the summer of 2014 the team mounted exhibitions of these paintings in the communities and held consultations on how best to proceed with the repatriation work in each context. Read more here. In the summer of 2015 Dr. Walsh was contacted by Survivors from the MacKay School at Dauphin who were interested to know the names associated with the paintings from the Aller collection created at the MacKay IRS. In September 2015, two representatives from this group came to UVic to see the paintings and meet Survivor Wally Samuel and myself to hear more about our work. The result of this meeting was an invitation to Wally Samuel and Dr. Walsh to travel to Thompson Manitoba in February 2016 with the paintings to a gathering of MacKay IRS Survivors. There Wally and Dr. Walsh presented the work on the Alberni paintings repatriation, and began discussions about moving the paintings from the MacKay School back to families in Manitoba. This work will follow the protocols set out by the MacKay Survivors, but the team will carry with them the teachings that have been given through the repatriation work on the west coast as they begin this next chapter in a good way. This group of Survivors has an archive of their school already in place at the University of Manitoba, and this collaboration will include the U of M and the newly opened National Centre for Truth and Reconciliation. As part of this work on the MacKay IRS paintings, Dr. Walsh is working with Lorliee Wastasecoot, a UVic political science student, and a Lenonet student. Lorilee is the daughter of Jim Wastasecoot of the Peguis First Nation. He is also a Survivor whose childhood painting is part of the Dauphin collection currently in the care of Walsh at UVic. 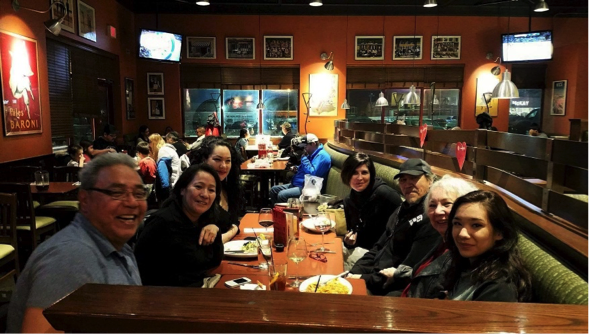 Jim and his wife are leading the Manitoba Survivors group in the emerging collaboration between the Survivors, the University of Manitoba and the University of Victoria. Lorilee will be working with Walsh for her Lenonet Research Apprenticeship at UVic to document the return of this artwork to MacKay IRS Survivors in 2016-2017. Family dinner in Thompson, MB with L to R; Walter Wastesicoot, Jennie Wastesicoot, Lorilee Wastasecoot, Andrea Walsh, James Wastasecoot, Karen Wastasecoot, and Brooklynn Monkman. Finally, the Survivors, Dr. Walsh and her team of students were awarded by the BC Museums Association a 2016 Award of Outstanding Achievement for their work done in collaboration through museums and community engagement.